DisruptCRE provides enriching discussions and educational events surrounding emerging CRE technologies. Industry professionals and entrepreneurs will explore how the Internet of Things (IoT) is becoming more integrated in commercial buildings, increases in tenant engagement and concierge services, the use of virtual reality, and the other technological tools all making waves in the industry. The highlight of any DisruptCRE is the “Meet the Disruptors” segment where CRE tech companies pitch their offerings to the attendees. Attendees include VTS, Real Liquidity, Comfy, Bractlet, Matterport, TurningArt and more. 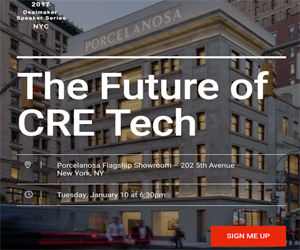 Three educational panels including the anchor sessions the “State of CRE & Tech” involve the industry’s most recognizable and powerful executives in the industry. Other panels discuss the tech products and service in use right now, what’s being implemented, and what technology has the industry excited for the future. “We take the topics that are crucial to the future of this industry, and unpack them in a way that makes it easy to digest,” says Mariel Ebrahimi DisruptCRE CEO and conference day host. Panel participants include Jordan Nof, Head of Investments at Tusk Ventures,Poonam Sharma Mathis, Founder & CEO at StealthForce, Kevin Guy, CEO at RealLiquidity and Chad Lindsey, VP of Global IT at JLL, Alec Manfre, CEO & Co-Founder at Braclet, and more top industry professionals. The conference closes with a networking event and time to engage with tech companies, sponsors, and other industry leaders. DisruptCRE hosts conference events in major cities across the United States aimed at bringing together industry leaders and emerging startups that impact the commercial real estate. Users can buy tickets to the Dallas event here.